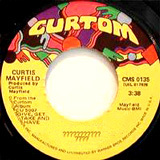 Here's a a great Atlanta modern soul single recorded by Tony Troutman in 1976. Tony was a member of the funk band zapp and "Roger Troutman" 's brother. Very in-demanded single by many Soulful collectors, you can also find a reissue of this single. Tony has also recorded an album "your man is home tonight" and different singles like i truly love you (vocal) / i truly love you (instrumental) that I advise for a few bucks !